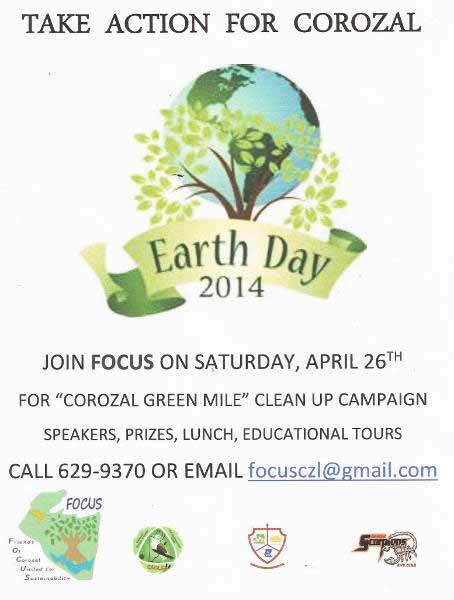 FOCUS, other environmental groups, the Corozal Town Council, and others invite groups to the Corozal Green Mile trash cleanup campaign, beginning at 7 am on Earth Day, Saturday, 26 April 2014. Groups should contact FOCUS as soon as possible to get trash bags, gloves, group leader t-shirts, water, etc., for the event. Groups will "Adopt a Mile" of the Phillip Goldson Highway in the Corozal District. Cleanup will begin on your assigned mile at 7 am, and all groups will meet at Mangrove Park by 11:30 am. The aim of this project s to increase awareness of trash clean up, Corozal Bay Wildlife Sanctuary (CBWS), FOCUS, PACT, Mangrove Park, sustainability and educational events and classes. Earth Day is an international effort to keep our countries green and clean, including Belize. Call FOCUS at 629-9370 or email [email protected] to let us know you'll be participating. We also need support and donations for supplies for the cleanup. Sadly this was another failure. It is so sad that the people of Belize do not care. Been There & Done That . . . and glad to be out.